To travel westward across the U.S. is to experience a striking landscape metamorphosis. Stately hardwood trees give way to squat shrubs, verdant cornfields to brown wheat and lush grasslands to cacti and creosote bush. The air dries out and the land is often parched. This rather abrupt shift from the humid east to arid west occurs along a border that slices neatly through the Canadian province of Manitoba, then the Dakotas, Nebraska, Kansas, Oklahoma, Texas and into eastern Mexico. The divide is so stark airline passengers can see it—a patchwork quilt of green farms on one side, a vast expanse of brown and gold on the other. And now this boundary is on the move, creeping east as global temperatures rise, according to new research published last month in Earth Interactions. Given the line’s historical role in shaping U.S. westward expansion, its shift could alter the agriculture that plays a crucial role in the economy of the Great Plains states. Geologist and explorer John Wesley Powell was the first scientist known to have conceptualized the east/west climate divide in the mid–19th century. Soon it became known as the “100th meridian”—for the longitude with which it roughly coincided—and took on a sort of mythic status in the country’s lore. More than a century later it caught the attention of Richard Seager, a climate scientist at Columbia University’s Lamont–Doherty Earth Observatory, when he chanced upon a world map of population density. On it he noticed a sharp drop west of the 100th meridian: The sprawl of homes, commercial facilities and roads starts to vanish along with the vegetation. Even seen from space, the city lights of the east quickly fade into darkness west of the line. Seager wanted to know more about how the humid/arid divide might have influenced the stark population falloff. First, he and his colleagues set out to decipher if the line was a true physical entity, because it had yet to be analyzed with modern scientific data sets. The team found the boundary was clearly defined in drought and precipitation patterns as well as in measurements of soil moisture and vegetation, according to the Earth Interactions research. “What I like about the paper is that it keys in on what has become myth—but shows it to be fact,” says Martin Hoerling, a meteorologist at the National Oceanic and Atmospheric Administration who was not involved in the study. The modern data also helped Seager and his colleagues understand why the line exists. Powell had correctly noted the western plains are dry in part because they lie in the rain shadow of the Rocky Mountains, which block moisture sweeping in from the Pacific Ocean. Seager’s team found the line is also reinforced by Atlantic winter storms and by summer moisture moving northeast from the Gulf of Mexico. With a firm understanding of the science behind the humid/arid divide, Seager set out to understand how the boundary might change in the future as the world warms. Using climate models the team showed rising temperatures will likely push the divide east, as the parched western plains expand. Arid takeovers like this happen because rising temperatures enable the atmosphere to hold more moisture, thereby increasing evaporation from the soil. Thus transitional lands at North America’s humid/arid divide could dry out and formerly moist areas could become the new transition zone. This shift is not confined to some distant future: Data collected since 1979 suggest it is already underway. The divide now seems closer to the 98th meridian, some 100 miles east of the 100th, the team says, although there is significant year-to-year variability within the data. But Hoerling has raised some questions about the accuracy of the projections for an eastward shift, at least along the boundary’s southern reaches. Since 1950, there has been an as-yet unexplained lack of a clear rise in temperatures in the southeastern U.S.—a phenomenon dubbed the “global warming hole.” “If we can’t explain why [the Southeast] hasn’t warmed,” Hoerling says, “why should anyone believe us when we keep saying it’s going to warm yet more?” With temperatures remaining steady in the Southeast but rising in the Southwest, the climate boundary should stay in place and become even starker along its southern stretch. Seager agrees this “hole” presents a potential complication for his team’s work. But he points out the shift is already evident in their observational data, and notes there are some indications the hole may have already started to disappear. It could be an example of a natural climate variation, which would mean the line’s eastward shift could probably happen in fits and starts, Seager says. 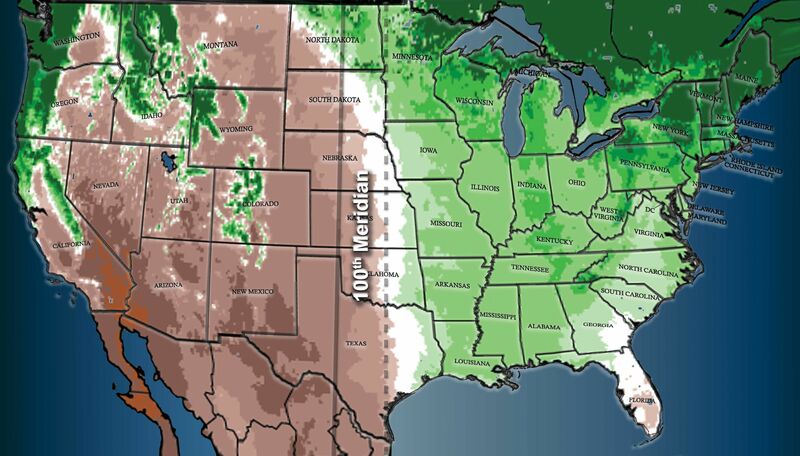 If Seager’s projections bear out, the shift could transform agriculture on the east side of the 100th meridian—which has long marked a difference in crop types and farm size. Thirsty corn is grown in the humid east whereas drought-tolerant wheat thrives farther west. Farms in the western plains are also generally much larger than those in the east, to compensate for their vulnerability to drought—thus the line plays a role in the population drop-off that sparked the study. Seager, drawing on history, predicts farms on the eastern edge of the divide will have to consolidate and become larger in order to survive as the land dries out. Eastern farmers may have to abandon corn in favor of heartier wheat and even rangeland because large expanses of cropland might fail altogether without sufficient water. Such a shift, Seager says, will likely increase prices for corn, corn products and, along with it, meat (most livestock are typically fed corn), potentially reducing consumption.